I’ve read the previews and seen some of the pages for Maestros and I’m reminded of Geoff Darrow’s work. This looks gorgeous and the story has a vibrant pop to it, so I’m in. I saw it on a pull list elsewhere and its positioned rather low there and I wonder why more people don’t read stuff like this. This is not a rant about my tastes in content being better than others, but for its own sake, of work that tends to go unnoticed. And in its own inimitable way, Sherlock Frankenstein also looks to be promising fun stuff. 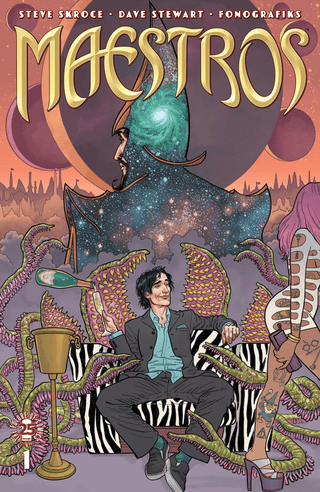 Maestros #1 - The Maestro and his entire royal family have been murdered. Now, his banished son from Earth will inherit the Wizard King’s throne along with a spell that turns its user into GOD. With enemies everywhere, will this Orlando-born millennial be able to keep his new magic kingdom? From STEVE SKROCE, the storyboard artist of The Matrix trilogy, the artist and co-creator of WE STAND ON GUARD and Doc Frankenstein, the writer / artist of Wolverine, and the artist of Amazing Spider-Man and ALAN MOORE’s YOUNGBLOOD. Sherlock Frankenstein & The Legion Of Evil: From the World of Black Hammer #1 - Lucy Weber, daughter of the Black Hammer, grew up to become an investigative reporter for the Global Planet. Now she’s on the hunt for the true story about what happened to Spiral City’s superheroes after they defeated Anti-God and saved the world. All answers seem to lie with the dangerous super villain tenants of Spiral City’s infamous asylum. As she gets closer to the truth she uncovers the dark origin stories of some of her father’s greatest foes, and learns how they tie into the puzzle of what happened to Spiral City’s greatest hero. Kill Or Be Killed #13 - Caught in the crossfire between the police and the Russian mob—and his sanity—Dylan begins to realize his problems are more dire than he thinks. BRUBAKER & PHILLIPS’ multiple Eisner-nominated series keeps racing from hit to hit in this action-packed third arc!